Margo Kelly: Extreme REVISIONS - What Would YOU Do? Extreme REVISIONS - What Would YOU Do? I know writing "the end" on your first draft of a manuscript is pretty exciting ... but certain elements of the revision process thrill me just as much. It's like working a jigsaw puzzle ... but certain parts of the picture change during the process and you must adapt and move with it. 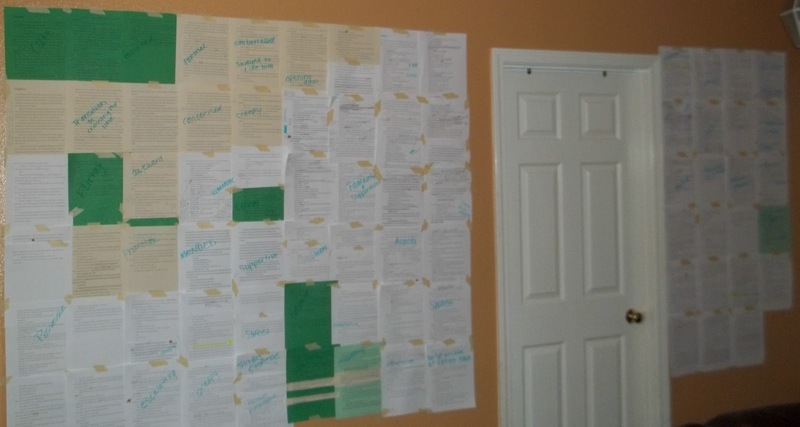 And I remembered those crazy pictures of pages taped to a wall. So, I printed out all of the conversations between my main character and three other characters (one is the real bad guy and two are potential bad guys to keep the reader guessing). I even used different colored paper to help me quickly spot who was participating in the conversation. 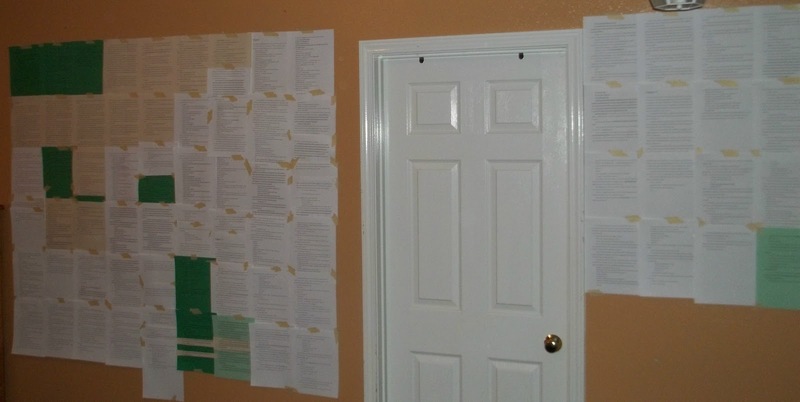 It took a long time to print the pages out, and it took a long time to tape them to the wall. I doubted the process and the time invested, but I went through the WHITE pages first ... twice ... and it wasn't until the third pass that my brain clicked and saw the words in a different way. I had a big AHA moment. YAY! I quickly started to scribble modifications in pencil. And then I grabbed a blue highlighter and started to write the emotions on the pages in big letters so I could stand back and see the progression of the relationship. I used red stars to mark certain types of moments and yellow stars to mark others. Then I attacked the colored pages. My kids came home from school and their eyes bulged out ... they thought I'd gone a bit crazy! ha. This morning, I went through the pages on the wall again and was thrilled to realize how well everything now flows. Success! Was it worth the effort? Absolutely. What's your most extreme method for revising? Yesterday, on my blog, I put up a picture of my massive storyboard that takes up a good portion of my bedroom wall. It's got a notecard for each chapter that contains the chapter summary and objective, and beneath each notecard is a stickynote--different colors represent different storylines. It works for me because I can see at a glance if storylines are spaced out, or too heavy in sections. Christi - sounds like the strategy I read about in SAVE THE CAT ... I plan to utilize it for my next ms! You are quite welcome to sort out my book at the moment, please - wish I could whip up your enthusiasm..
Go, Margo. You rock, you really do. I guess my editing process consists of me reading teh whole thing out loud to see how it sounds. Then I include BETA readers who will always pick up things I hadn't thought of. But I can appreciate unique ways to do things such as what you tried. I used to design online classes--another life! But I found that spreading the work out around my walls really did help me "see" the whole and where I needed to add or delete or rearrange material. There's something about the computer screen that simply doesn't allow me to organize the whole. I haven't applied the technique to my books because I still like to print out at various stages of the process and read. Somehow, reading the pages is enough, but when it's not . . . guess what? Look out walls! Lovely post. You reminded me of another approach to this editing process. Thanks for stopping in at the Write Game. Visitors and commenters are always so valued. WOW! That's quite a revising process! But I'm so glad it worked for you! That's just crazy (hehe). Please tell me I'm not going to be doing that in six months--please?! I think certain "techniques" are only necessary if there's a PROBLEM. I don't think it's necessary to go to this extreme with EVERY ms, but I had a specific problem with the dialogue between specific characters, and I couldn't identify it on the computer screen or merely on the printed page. That's why I tried this extreme method. But ... sometimes simply changing the type font for a written piece will help identify problems. Something about making your brain interpret the information differently brings new sparks and ideas to the process. Wow I AM IMPRESSED! When you said "I doubted the process and the time invested" I nodded and thought you were going to admit it didn't work, but it did and I may have to try it myself now LOL! I was going to suggest getting someone to read the pages out to you. I find that helps me, but your new approach looks amazing and yes lots and lots of work! Good for you. 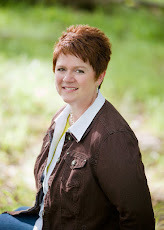 Hi Margo, thanks for visiting my blog. Gee! The first thought I had was this would make a great Art-exhibit. First, congrats on typing -the end! That in itself is a triumph! I have only gone as far as to cut and paste into a word doc. files, and then color code segments. My world of 'space' these days is now reduced to my laptop. I could just imagine your kids-that was funny! Good to know the process works!